We offer 'on-going' and 'race specific' coaching plans. Our plans are athlete-centred, meaning that they are built around you and your particular need and goals. Our 'off the shelf' plans are generic adaptations of our past successes. 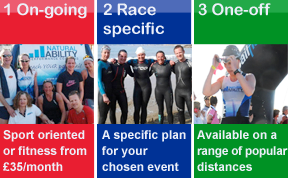 For one-off payment you can purchase a plan for one of the popular distances. hard, when to train easy and when to rest, but even more importantly it'll listen to you and adapt to keep you on the most effective route as you progress. Our 'on-going' and 'race-specific' programme's include sport specific sessions, strength and conditioning routines, access to Training Peaks software and regular feedback session with your coach.